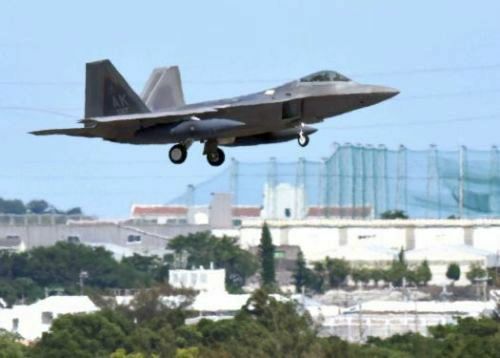 U.S. F-22 Raptor stealth fighters were first deployed to Okinawa in 2007, and have again been temporarily deployed to Kadena Air Base. Following deployment, the number of noise occurrences in neighboring municipalities doubled, and complaints from residents increased as well. The U.S. Air Force’s newest stealth fighters, F-35As, had been provisionally deployed for about six months to Kadena Air Base, and just returned to the United States in early May. Consecutive aircraft deployments raise concerns about intensified noise and increased complaints from surrounding municipalities. At the Roadside Station (Michi no Eki) Kadena around 3:10 p.m., four F-22 fighter planes appeared above Kadena Air Base, turned around, flew through the sky, and landed. Staff of Kadena Town and Chatan Town gathered and watched after receiving a report about F-22 provisional deployment from the Okinawa Defense Bureau. Portable noise measuring instruments brought by a staff member recorded the F-22s’ noise at 91.4 decibels. Two aircraft landed around 3:40 p.m., and four more aircraft landed around 7:10 p.m.
Around 3:40 p.m., approximately 30 minutes after the arrival of F-22 fighter planes, F-15 fighter jets took off from Kadena Air Base. The highest noise recorded on this day was a figure of 101.1 decibels at Yara in Kadena Town. Tourists who were visiting the Roadside Station stopped talking because of the noise and stood still, frowning. President Sachio Kuwae of the Three-City/Town Liaison Council on U.S. Military Kadena Air Base (Three-Party Council), which is comprised of representatives from Okinawa City, Kadena Town, and Chatan Town, spoke in regard to aircraft deployments and how they increase the burden on residents of the surrounding areas. Kuwae emphasized, “The U.S. military must adhere firmly to the promise made by Japan and the United States.” On a representative of the city, he shared his thoughts about watching over flights routes and early morning and late-night takeoffs and landings.